A concrete driveway can become a thing of beauty when colour is added to the mix or dusted on during the process. Then it can be stamped with patterns that can resemble flagstone, pavers, stones or brick. 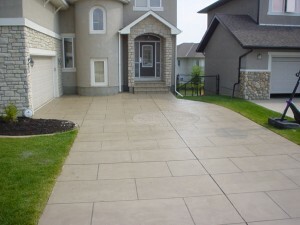 Stamped concrete can range from around $8 and go over $18 depending on complexity and materials. If you’re just looking to colour your concrete driveway you can match up almost any colour to compliment your home or surrounding outdoor décor. Concrete engraving can be done on existing driveways. At a considerably lesser price point, usually $3 to $6, it’s a great way to spruce up an existing drive. Staining concrete is really becoming the way to create beautiful driveways. Chemical stains are used for both interior and exterior so your driveway look can carry straight through to your garage floor. Contact us for a quote on your new driveway.